PrepLadder is back with its most awaited exam for this year. PrepLadder’s Mega All India exam will be conducted on 3rd December instead of 5th November. Mega All India Exam will now be conducted at an even bigger scale in 79 cities across India. Something this massive has never been done for FMGE aspirants before. Like the real FMGE exam, this exam will be conducted in a single morning shift. We apologize for the inconvenience caused in you have already booked your exam slot for 5th November. Your registration will be valid for 3rd December exam and you will receive 100% of your booking amount back as PrepCash. - Mega All India FMGE will be conducted on same software as real FMGE exam so that you can have an essence of what the actual exam looks like and you don’t waste your time in adjusting yourself with the software at the time of exam. - Exam pattern and questions will be exactly on expected FMGE pattern. 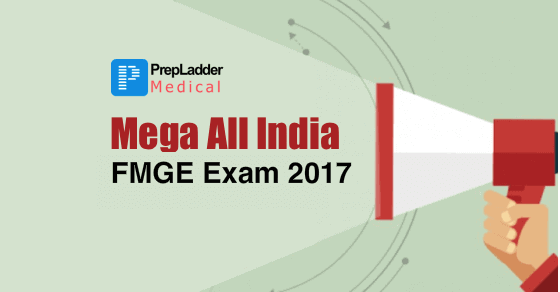 Many topics from our last year’s Mega All India exam were repeated in the real exam of FMGE 2016 and this can surely be expected for this year as well. - Thousands of competitors from around the country will participate in Mega All India. So, don’t miss this chance to know your level of preparation before the actual exam. *You can also book your slot using the available PrepCash in your account. Motive behind keeping low fees for this exam is to encourage maximum number of competitors to appear for Mega All India. PrepLadder’s results speak for themselves. Achievers of last year’s Mega All India exam cleared the real exam with amazing score. If you are really serious about FMGE 2017, don’t miss this chance at any cost. Test slot registration is now open. Limited slots are available per center. To book your slot, click here.